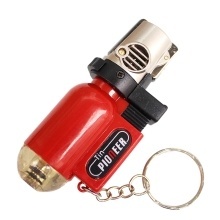 This butane refillable torch lighter is a micro torch pocket lighter. It is used for pipes, cigars, and cigarette-lighting. It has a clear view of the fuel chamber at its base for easily viewable fuel gauge. Available in a wide array of colors and finishes. You&apos;re sure to find one to suit your taste. Small and lightweight, fits in your pockets for easy carrying. Refillable, if butane runs out, inject any universal butane lighter. Flame adjustable, convenient to control the size of the flame. Works well even in wind conditions with effective and hot flames. Transparent and clear base, for easily viewable fuel gauge. Also great as a torch lighter, suitable for outdoor activities such as hiking, camping, BBQ, etc. 1. Due to international shipping safety regulations, items filled with butane gas is not allowed to be shipped. So the lighter you received contains no gas, you need to refill it first before using. 2. When you adjusted to the lowest setting, there will be no flame for safety design. And when adjusted to the highest setting, the flame will last for one or two seconds after releasing the button because there will be a little remaining gas in the ignition hole, please pay attention to it. 3. Please do not press the ignition button for a long time to prolong the service time.